When summer heat becomes demonic my ordinarily acoustically conducive listening environment suffers greatly. Last week was such an occasion. The 100-plus-degree weather necessitated the noise of fans, air conditioners and an especially annoying blower on my computer that kicks in at a certain point and is so noisy that music listening becomes quite difficult. 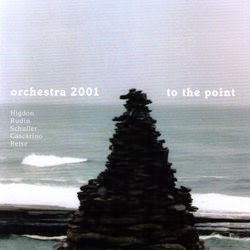 The result is that though I went through the motions of hearing Orchestra 2001's To the Point (Innova 745) five times as per the usual with me, the quiet sections of the works ended up sounding like "music for blower with some kind of unidentified additions by unspecified instruments." But I am now listening again in a cooler planetary episode, so that all the lovely quietude comes through. First things first. Orchestral 2001 is a relatively new organization, formed in 1988 by conductor and music director James Freeman. They are in residence at Swathmore College and concertize there as well as in Philadelphia venues when not touring. They specialize in the music of the 20th and 21st centuries. There are a number of recordings out. To the Point is the first I have heard with any concentration. Five works come into play.The first is an effervescent little fugal overture by Jennifer Higdon, which forms the title to the album and frames the concert offerings in an anticipatory way. Next up is Andrew Rudin, who I am ashamed to admit last came to my ears through his electronic piece Tragoedia, on an old Nonesuch recording from the late '60s. His "Canto di Ritorno (Concerto for Violin and Orchestra)," with Diane Monroe playing the solo part, has the sonic plaintiveness of the Berg concerto minus the tragedic expressiveness and instead with a good deal of gossamer and fairy dust for our midsummer revelries (or rather reveries, I should probably say). Then there's the marvelous Gunther Schuller "Concerto da Camera," a very evocative work with the sort of orchestrational brilliance Mr. Schuller conjures up so well, and some more quietly playful and elegaic passages. Romeo Cascarino's "Blades of Grass" has beautiful largo writing for strings and Dorothy Freeman on English horn. It's another meditatively quiet piece. Don't run the fan with it! Finally there is Jay Reis's more bravura "The River Within (Concerto for Violin and Orchestra)". Maria Bachmann takes on the solo part with admirable passion and presence. It is a more traditional sounding modern concerto it its dynamic thrust and the clarity of its orchestration, but nonetheless shares with its fellow works a kind of pastoral playful translucency at times. In the end To the Point fully satisfies the ears with a quintet of works that have the newness of modernity but also grandly sonic post-romantic narratives of depth and colorful orchestral utterance. It is music mostly on the quiet side. It is a tribute to Maestro Freeman and Orchestra 2001, certainly a most formidable new music, new music institution. This one deserves your undivided attention and pays off with works showcasing poetically the modern orchestra at its best. Recommended. Granted there may not be a lot of music lovers out there that respond to Bach's Suite for Cello (covered in the last review) and Eli Keszler's Oxtirn (ESP 4061) with equal pleasure. Since I am one who does I figure there must be others. For those who would vastly prefer one over the other, you are of course equally welcome here. I imply that there is a vast difference in outlook and result between Bach and Keszler. I suppose that would be an understatement. 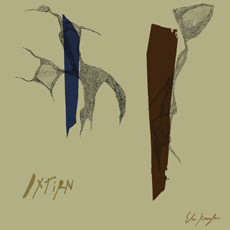 Oxtirn IS a body of music that, like Bach's Suite, is produced entirely through human hands playing instruments of a non-electronic sort (except perhaps there is feedback from microphones, not sure of that). In Keszler's case you get drums, crotales, guitar, clarinet, trumpet, tuba, trombone, piano, plus unconventional sound making devices--like motors, sheet metal, spring harp and other prepared metal objects. The conventional instruments are not played conventionally much of the time, either. It is a great symphonic cacophony of noise sculpture that results. The LP version came out last year and sold out. This new CD version adds a third sonic event, which is a good addition, not an afterthought. Oxtirn does what it does with a certain amount of excellence. Many people may find it unbearable. It is not music to put on at all but the most Bohemian cocktail parties, and even then this might be something for the very end of that get together, as it may well drive out the guests. Nonetheless Keszler and his several cohorts make a very good job of it. As far as extreme avant music goes, this one deserves a serious hearing. It has some of the home-made sonic iconoclasm of Kagel's Acoustica (for those who know that piece), only it is far more grating. Be warned, be entraced, be infuriated. That's your job as the audience. It's not music that you'll forget quickly. As a confirmed Bachaholic since my early teenage years, I've long felt that the best place to experience the musical mind of JS was in his Suites for Solo Cello, the Sonatas and Partitas for Solo Violin and the Well Tempered Clavier. Now this is hardly a revelation. Nevertheless it is true that the brilliant line weaving and expressive contrapuntal elementality might be said to be shown most clearly in these works. Of course for the counterpuntal simultaneity you get that mostly in the clavier series. But for the brilliantly inspired melody that Bach could whip together in an almost otherworldly fashion, the cello and violin works are virtually unsurpassed. Of course, in the hands of a player less than brilliant, this can be a very instructive but also slightly painful experience. In a recorded world you start remembering where an intonation lapse is going to occur, when the phrasing gets sloppy, and you start to cringe. 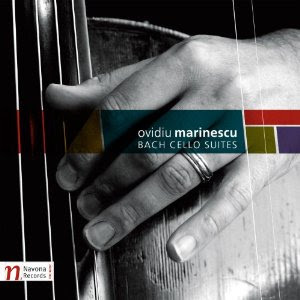 There is no danger of that when hearing repeatedly Ovidiu Marinescu's new recording of the Six Suites for Violincello (Navona NV5840). He is a player of impeccable accuracy and considerable expressivity. All six suites fit nicely on 2 CDs, which perhaps everybody knows but me, since I still have a couple of LP sets I listen to--and then it's a matter of THREE disks. Everyone will I hope recognize the prelude movement of the first suite (usually heard more often on the "street" as a piano version from the Well Tempered Clavier), since it seems to have taken over from Satie's Gymnopedies and Pachabel's Cannon as the pop-co-opted classical piece of the moment. I've heard it on at least two commercials, the Mentalist, and a couple of other places. Naturally it is a prelude and not really Bach unleashing his full creative forces. Nonetheless it is of course quite lovely and Marinescu does a fine job interpreting the rockingly ongoing quality of it. But then you get beyond that for some of the finest of the small-forces Bach and Maestro Marinescu really comes into his own. This is a warm, vibrant, expressively empassioned version of the suites and it is a true joy to hear. Plus if you put the disk on a computer you get nice extras, like a full set of scores to follow along with, a digital booklet and etc. If you are in the market for some glorious Bach, this one comes through. It's ready-to-hand (just came out, after all) and it will brighten your space dazzlingly. Very recommended. The new Symphony No. 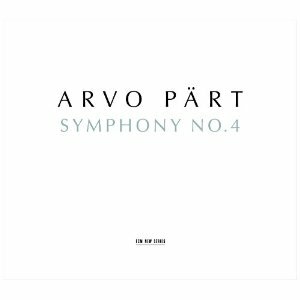 4 (Los Angeles) by Arvo Paert has the sonic epic qualities of a high romantic symphony, but with the transparency and post-Minimalist soundscaped quality that Paert creates so distinctly. The ECM New Series (2160 B0014663-02) recording of the work by the Los Angeles Philharmonic under Esa-Pekka Salonen has great majesty along with the proper ambiance Paert's music demands. You get those highly original Paertian harmonic progressions, the spaces, the dramatic contrasts. It portrays a somber, tragic-toned mood. That has something to do with its dedication to Mikhail Khodorkovsky, who has been incarcerated in a Russian prison since 2003 for reasons that may well be political. It is an ambitious work, fully worthy of the symphonic appellation given (perhaps more so than some of his earlier symphonies). Fragments from Paert's Kanon Pokajanen round out the program. 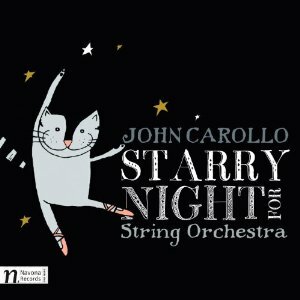 John A. Carollo is an American composer whose music has not reached my ears until now. After hearing his Starry Night For String Orchestra (Navona 5844) several times for this review, I am glad to be catching up with him. The CD features six of his works. All have something to recommend them to our ears. The first and last compositions, two pieces for string orchestra, "Starry Night" and "Nothing Shall Come of This" form a kind of musical set of bookends to the pieces in between. The orchestral piece "Anguish in Every Household" fits in with these two in that all three have something of the crusty pioneers of American modernism--Ives, Ruggles and perhaps Henry Brant--embedded in them. (And others, too.) The thought is that he roots himself in the past in order to create another possible future for American classical music. There is mystery and wonder painted with memorable tonal expressionism. Sometimes one is reminded of the Ives of "Central Park in the Dark" and "The Unanswered Question," not in terms of imitation but a kind of building upon the legacy of those masterworks. And there is the lushly full but cragged harmonies of the early masters too. The middle pieces, Quartet No. 1 and "Moravian Sax in the Afternoon" have some of the rustic plainess of shape-note hymns, some of the rooted qualities of the American landscape (and in this case, since Mr. Carollo is Hawaii based, a hint of tropical island open spaces), and at times a sort of puckish good humor. The piece for concert band, "Transcendence" has some restlessly modern modulating flourishes with latent power and forward thrust. In the end I must say that the CD has made me into a John Carollo enthusiast. He builds bridges back to what is best in the pionering avant garde of 100 years ago, incorporates what is conducive to his creative and melodic-harmonic spirit, and makes of it all something new, and very American. This is spirited, creative new American music, well performed and well worth a listen. If I am in any way a typical listener, and I am not entirely sure I am, my experience of and reaction to musical minimalism conforms to a pattern that may be somewhat widespread. There were several stages for me. First I was perplexed and bored that "nothing was happening in the music." Then I became tranced and entranced with the best of it, allowing it to take me where it will and not worrying too much about my initial expectation of conventional event structure. Then there arose works and composers that to my mind did not discern rightly between what might be interesting musical motifs and combinations, and those that just keep on clobbering you over and over with a kind of banality that enervates. Then there came new works and new composers who found ways to keep it interesting. The trance element may no longer be as active a factor in the new works, but there are other things going on to compensate the listener for the time spent. 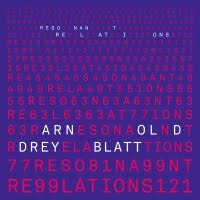 Belonging to this last category is Arnold Dreyblatt and his recently recorded work Resonant Relations (Cantaloupe). The CD contains the longish title work and a shorter "Twentyfive Chords in Ninety-Four Variations." The music is well performaed by the chamber ensemble Crash. The composer seems to be working on a modified tuning (is it untempered?) and that gives the ensemble some complex aural beating between tones that adds to the sound greatly. Beyond that this is music with a consistent pulse (the title work, that is). It does not have a readily apparent processual bent--like Reich's early music and Riley's "In C" do. In fact along with the development of recurring motifs there seems to be a pre-minimalist attention to event periodicity. Not in some set of movements, but rather in terms of episodes. One sort of thing goes on for a while; then something slightly contrasting goes on for a while, and so on. Since there is not much trance-like sound happening in this music, the episodic structure keeps it from getting boring, as does the fairly complex interplay of instruments, counterpoint if you will. The second piece ditches the pulse and articulates (untempered?) chord clusters singly with spaces in between (a little Asian-like/Cage-Feldman-like in that) in ways where the instrumental combinations, manner of articulation, and tone color are continually changing. It's quite interesting to hear and contrasts quite nicely with the title piece. So here we have a rejuvenated sort of minimalism, one that does not sound much like the earlier works. It's original, in other words. Its tonality is overtone-like; its event structure is periodic; its aural makeup is engaging (thanks in part to the exotic tuning); and it changes over time in ways that are not like the superorganicism of early Reich. It's more like a sophisticated topsy, to the unmediated ear anyway. I recommend this one. It has much to it that bears hearing. Arnold Dreyblatt has something going on that I hope we can hear more of over time. Of all the recognized Russian composers of the 20th century, Alfred Schnittke (d. 1998) often sounds the least Russian. He ordinarily avoids nationalist melodic, harmonic or rhythmic tendencies, preferring instead to carve out his own version of the expressive modernist international style in its later developments. This is especially true of his chamber music. 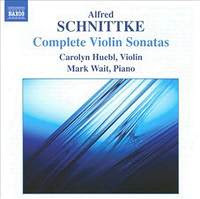 Schnittke's four sonatas for violin and piano were composed over most of his active career, the first stemming from 1955, the last, 1994. It turns out they all fit nicely on a single 70-minute CD. Violinist Carolyn Huebl and pianist Mark Wait set out to do just that, and they have succeeded in giving us thoroughgoing, expressive and exacting performances of same on a new Naxos release (9.570978). Other than the first (unnumbered) sonata from 1955, these are certainly on the surface of things firmly in a modernist tradition. They nevertheless bear the individual Schnittke watermark: often utilizing twelve-tone-serial-and-beyond techniques but in a very personal way, freely bending them toward his own harmonic and rhythmically lively ends while culling and synthesizing the full spectrum of concert music styles from the Baroque to the present, all in ways that are distinctly Schnittkian in their strikingly inventive thematic idiosyncrasies. The violin sonatas are excellently representative Schnittke. The 1955 work a fascinating look at his early beginnings, the first through third sonatas masterpieces of 20th century chamber arts. Ms. Huebl and Mr. Wait do an excellent job bringing out the nuances of these very complex and vital works. The sound is very good as well. It's a treasure trove for an Schnittke enthusiast; it also serves as a good introduction to his music for anyone unfamiliar with it. At the Naxos price the disk is especially attractive! Robert Spano and the Atlantic Symphony are doing excellent work. The orchestra's new label ASO Media is not only a good idea in a current climate where self-determination is often the best option; it is also providing in its first two releases some important interpretations of works by composers who deserve attention. The second release (CD-1002) is a good example. Christopher Theofanidis's "Symphony No. 1" and Peter Lieberson's "Neruda Songs" contrast nicely and make a fine listening experience individually as well. Gongs, mallet instruments, chimes and winds set against translucent string writing on the ecstatic Theofanidis symphony. It has the multifold, lyrical sunlight-and-air feeling of the best Sibelius works, yet it manages to sound more contemporary by extending its musical syntax into long interwoven strands of motives and sound color with episodic linearity. Theofanidis's poetic command of the orchestral sounds available to him and the way he corrals then to his expressive ends impress and excite. This is ravishing music to chase away your dark moments. Lieberson's "Neruda Songs" on the other hand is moodier, a little heavier, like a set of plush velvet curtains. Mezzo-soprano Kelly O'Connor seems a very proper instrument for this music, declamatory and full-bodied. Post-Wagnerian-Mahlerian-Bergian heft in the orchestra give gravitas to the poem settings. It's a satisfying listen. Mediterranian sunlit dazzle versus Teutonic ponderousness. Theofanidis versus Lieberson. Fine performances, well-recorded. Everything seems right about this one. Highly recommended. Joseph Schwantner's Later Period Wonderfully Represented in "Chasing Light"
Joseph Schwantner has gone from the status of a very promising young modernist American composer in the late '60s to one of our very best today. 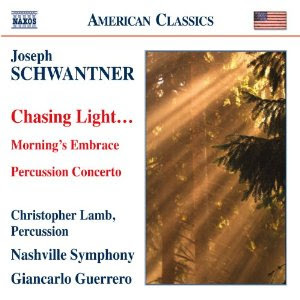 The new Nashville Symphony recording of three of Maestro Schwantner's major later period works, Chasing Light (Naxos 8.559678), makes it clear why. He has developed a vividly colorful orchestral palette which he uses to cover musical canvases in ways that strike the ear and remain memorable long after they have been heard. The CD gives listeners a generous 68 minutes of his music. The 1994 "Concerto for Percussion and Orchestra" brings together some very difficult and exciting percussion soloing (performed here by Christopher Lamb, for whom the work was originally intended) with orchestral brilliance. The National Symphony Orchestra under Leonard Slatkin (with Evelyn Glennie as soloist) did a version for RCA in the later '90s. That version was excellent, but Giancarlo Guerrero and the Nashville Symphony hold their own on the Naxos disk with a reading that is every bit as luminous, though I might give a slight edge to Glennie for her impassioned performance. "Morning's Embrace," the second work on the program, is a 2005 work with some prominent percussion and even more brilliant orchestral light. It depicts a sunrise in rural New Hampshire and it does so with all the resources the orchestra can muster. The final work (from 2008) shows that Schwantner does not stand still. His orchestral writing is confident, lucid and original. You can hear the development in his musical vocabulary in the 14 years represented on the disk, culminating in a rather thrilling dynamism and muscular energy that eschews trendiness and opts instead for a form of personal expression that cuts across catagorical niceties to go straight into a realm one can best call Schwantner music. He is a gem, a blazing sun of orchestral music today. Chasing Light gives you three exemplary works, played with conviction. It should not be ignored. The more I listen to the music of Einojuhani Rautavaara, the more I forget about stylistic categories and the more I revel in the sheer brilliance of his sound. And nowhere is this more true than on the delightful new disk Summer Thoughts (Ondine 1177-2). It's a collection of evocative pieces for violin and piano spanning an impressive number of years (1952-2008). There are seven works represented on the disk; all have a goodly dose of summer sunlight dappled into the violin and piano parts. It's Rautavaara the earthbound neo-impressionist here I suppose you could say. The world premiere recording of his 20-minute "Lost Landscapes" begins the program with a wistful nostalgia we often get at the start of summer. 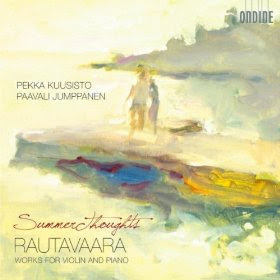 It is a work of great beauty, of sensuous tenderness, brilliantly played by violinist Pekka Kuusisto and pianist Paavali Jumppanen (and that also follows for the entire disk). Another extraordinary high point comes at the very end of the disk, with the 1952 "Pelimannit (The Fiddlers), Suite for Piano." Six movements charm, each based on a traditional Finnish polska fiddle tune. The duo decided to preface each movement with a literal statement of the actual fiddle tune, played on the violin, then let Rautavaara's piano part become a more direct commentary on each polska. It works very well, bringing out the variational strategies clearly for those not familiar with the original tunes. In between the bookended pieces are lovely atmospheric miniatures, one for solo violin, the rest for duet. This is music for a quiet summer afternoon. It is music that wears well with repeated listenings. It is brilliant music, performed with brilliance. It is a testiment to the vast scope of Rautavaara's musical vision. Do listen to this one! Carlos Franzetti Combines South American Jazz and Orchestral Music on "Alborada"
Carlos Franzetti brings together Argentinian-Brazilian strains, piano jazz and orchestral music on the very pleasurable Alborada (Amapola 9811). Carlos and Allison Brewster Franzetti share the piano duties and they sound very good indeed. There is a bass-drums rhythm section and the City of Prague Philharmonic provides the orchestral dimension. This is music that might be put in a "pops" category, except the music is perhaps too substantial and essentially serious for such an appellation. There are nine fairly short compositions. They stand out for their lyricism, the ringingly sensitive piano performances and the well orchestrated, well played and well recorded orchestral parts. It is feel-good music. Simply. But it is not fluff. There is much for the keen ear to revel in. Check the details by clicking on the Amapola Records link on this page.